Have you pre-order your Oppo F3 already? Get it from Aerophone and enjoy exclusive freebies! Oppo F3 is shaping up to be one of the hottest phones this season; and you can now pre-order it in Aerophone chain of stores nationwide. If you're waiting for a trimmed down version of the F3 Plus, this is it! The handset is now official as of this writing; in fact, it was released in the Philippines last May 4. Aerophone is offering a custom-made lunchbox for every successful pre-order of the Oppo F3. 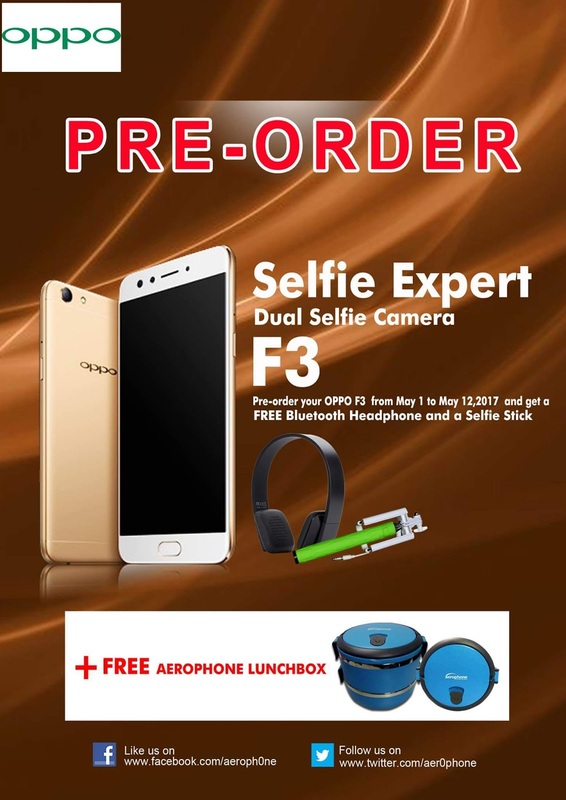 Likewise, you'll also get a bluetooth headphone and a selfie stick for FREE if you pre-order now until May 12. The Oppo F3 boasts a dual-selfie camera module just like its older brother, the Oppo F3 Plus. Specifically, it comes with a 16MP primary selfie cam and an 8MP secondary selfie cam. It also packs a MediaTek MT6750T processor with octa-core Cortex-A53 CPU and Mali-T860 MP2 GPU. The Oppo F3's display registers a smaller footprint compared to the Plus variant. This time, the handset is pegged to sport a 5.5-inch FHD IPS LCD. The same 4GB of RAM also ticks inside the handset. Other notable features are 13MP Rear camera, 64GB memory and 3200 mAh battery. Be the first one to get the Oppo F3. Pre-order it with Aerophone now. You can get it via HomeCredit with 9 months 0% interest, or via major Credit Cards with the same 0% interest for 12 months.